Arroz con Leche is really Mexi's "thing". On those days when there's not much to eat in the house, it's inevitable that my hubby will be in the kitchen putting together a pot of this sweet, comforting concoction. The great thing about arroz con leche...or rice pudding, basically...is that it is very versatile. He's probably never made it the same way twice. Sometimes he uses sweetened condensed milk. Sometimes evaporated. Sometimes regular ol' milk. I suppose that's why it always winds up on the stove when everything else is running dry...you can pretty much guarantee that we at least have rice, some variety of milk, and some sort of sweetener in the house at all times. Now, while Mexi's versions vary, whenever I am in the mood to make some, I make this version. To me, it is perfection. Sometimes I switch out the raisins with dried mango (my favorite dried fruit!) or cherries...sometimes I leave it out altogether. But this method using medium-grain rice (my preferred type/size rice grain) is what soothes me the quickest. Place cinnamon stick, orange zest, ½ tsp. salt, and 1¾ cups water into a 4 quart saucepan. Bring to a boil, then cover and simmer over low heat for 5 minutes. Stir in the rice, then cover and lower heat as low as it will go while still simmering gently, for ~17-20 minutes (until all of the water has just absorbed). Remove cinnamon stick and orange zest. Add milk and sugar to the pan. Set over medium-low heat and simmer until mixture just begins to thick (no thicker than the consistency of heavy cream), ~15-20 minutes. Turn off the heat and stir in the raisins (or other dried fruit). Serve warm, drizzled with Miel de Piloncillo. *This can be refrigerated in a covered container for a few days. It will thicken as it sits, so you will need to stir some more milk into it when warming it up. Por aquí es un postre clásico aunque con un toque distinto, que delicia. Rice Pudding is my dads favourite and like your husband it can de different every time! When I hear rice pudding I always think of the horrible pudding we used to be given at school, but this one looks gorgeous and for some time now I've been meaning to rediscover it. I love cinnamon so seeing the cinnamon in this one is inspiring me. I LOVE rice pudding and yours looks so elegant! Love the idea of adding mango. Looks very tempting! Love rice pudding, yours looks fantastic! Rice pudding is a treat I've come to love in the past few years. It sounds especially appealing today. I wish I could stay home from work and make a batch! great rice pudding and with the meil de piloncillo, yummy! 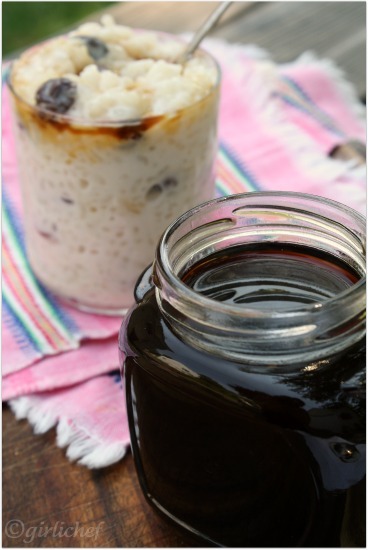 I'm a HUGE rice pudding fanatic, so I need to try this version! Seems like total stick-to-your-ribs comfort food to me! Indian version is a bit different.. But this looks yummy too..
YUM, YUM, YUM....love rice pudding...just love it! 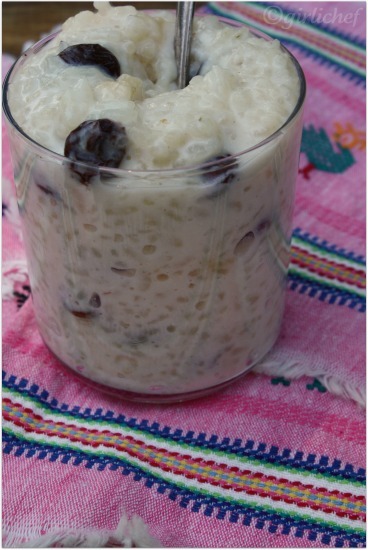 I love arroz con leche but I've never made it! 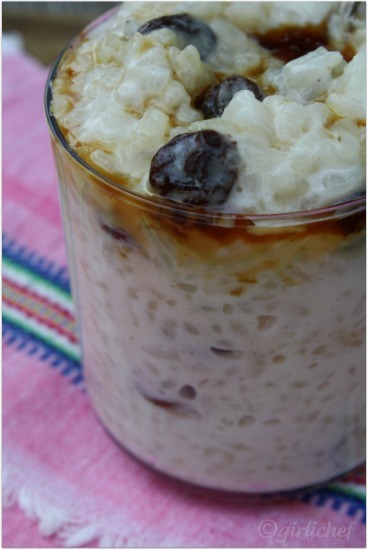 I want to get that glass of arroz con leche from my screen! oh my gosh, my husband would dive headfirst into this too, YUMMY! I'm bookmarking this. I have the worst luck with rice pudding. I've tried dozens of recipes and never really like the results. Never tried this one.. but it looks delicious..
my grandmother used to make this when i was a kid...usually with condensed milk. i'd prefer raisins or dried mangoes, too. wow! this is really something new for me...yummy! Adding sea salt is very new in rice pudding and I would surely give this a try once, looks super tempting. Wow this is my kind of food love it! 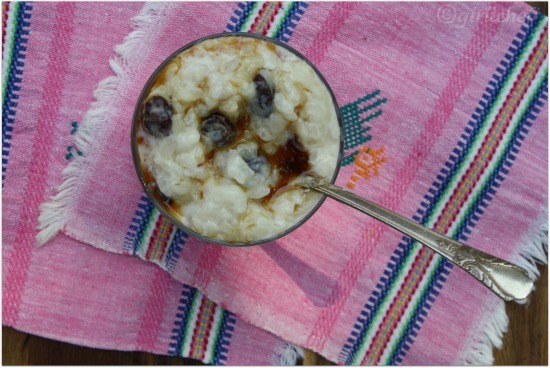 What wonderful memories Arroz con Leche brings back for me. My Grandmother would make this for me and still to this day is one of the most comforting things that I can eat. There is really no other thing like it. Your recipe looks delicious! Thank you so much for sharing with Full Plate Thursday and hope to see you again real soon. Hope you are having a great week! Rice pudding is one of my faves. No one makes it quite like grandma. Mmm, looks like comfort food to me. Great presentation. Thanks for linking it up to Sweets for a Saturday. I need to try this. My friend once made me a Dominican rice pudding, it was so good. Much try the Mexican one now. I love rice pudding! Reminds me of my childhood, grandma would make it all the time for us. Independence (Day) Popsicles - Happy 4th of July!